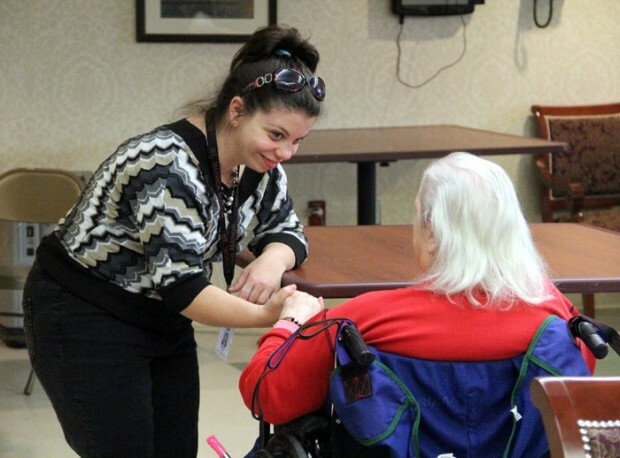 Residents are happy when Alexa Bucci, a volunteer at South Philadelphia’s St. Monica Manor, stops in to see them. She’s warm and friendly, always there with a smile and always wanting to do something for them. Most of the residents at St Monica, which is an archdiocesan nursing home, probably don’t even realize Alexa was born with something that is generally termed a disability. Now 23, she was born with Williams Syndrome, a genetic disorder that strikes about one person in 10,000. Children born with the syndrome have moderate learning disabilities particularly in math and such tasks as drawing and assembling puzzles. They also tend to develop cardiovascular problems and other physical ailments. Over her relatively short life, Alexa has had her share of physical ailments. On the other hand Williams people tend to do well in spoken language, music and learning through memorization. One very common trait they mostly share could hardly be called a disability. They are almost always outgoing, have engaging personalities and tend to take an extreme interest in other people. In other words they are perfect candidates for volunteering at a nursing home. Alexa, who was a St. Valentine’s Day baby, attended St. Katherine Day School for most of her education, and graduated from the St. Katherine program at Archbishop Carroll High School. She loved Carroll where she easily made friends and no one treated her as having a disability. She not only volunteers at St. Monica, she works part time with PEP (Programs Employing People), an organization that specializes in persons with disabilities and also during tax season assists an accountant with light office chores. All in all Alexa enjoys a full life. A self-confessed music animal, she favors the Back Street Boys and Celine Dion, and loves hanging with her sister Christina, who is 18. 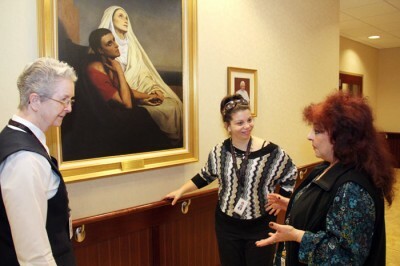 St. Monica Manor, has 180 beds and about 78 volunteers, 45 of whom are more or less steady, Tavani estimates. The majority is 50 or older, according to Tavani, but a few, like Alexa, are young. The volunteers do not do nursing work, they assist with the little things such as friendly visits with the residents, transporting them to the chapel, assisting at parties and other recreational activities or just adding that human touch that is so much needed. For information concerning volunteer opportunities at St. Monica Manor, call 215-271-1080 and ask for the volunteer coordinator.